As ultimately, a love story, Salt Pier is structurally perhaps a throwback to an earlier time. All the while trying to find its bearings in the 'natural' world, it follows an initially profoundly-alienated and self-alienated speaker along a developmental arc that begins in childhood and ends in a hypothetical present where a negotiated compromise with history allows him to finally know loving companionship. A reader may find it difficult to categorize this version of emotional closure as either comedy (in the strict sense) or tragedy, if one has to be had at the expense of the other. Perhaps in some ways it shares the spirit of Yeats' tragic gaiety. It is not embarrassed of its relatively straightforward structure any more than it is ashamed of its mostly uncomplicated diction or its occasional, fairly explicit use of meter and rhyme. Although its not afraid of difficulty, it stands against subjectlessness and pointless complexity in contemporary verse. It believes instead that there are too many other calls upon a reader's attention in this busy world to risk verbal superfluity or philosophical flamboyance of any kind. A story of personal liberation and discovery, it shuns empty agendas of theory for the ungovernable mystery of the tale. [Kiesselbach's] an opera singer who holds a note without becoming breathless. Kiesselbach has a stunning way to make the poetic phrase change meaning, and make better each line before and after. A trope that depends on synchronicity is not achieved/arranged by accident. His poetry is filled with green growing things, animals, nature's observances--and because of line lengths--a constant tension." "Poems often use a single image--meticulously described and most often from nature--as entry point to more profound territory. . . . [Kiesselbach's] language is compressed; sentences compacted by a geologic pressure to remove unnecessary words, leaving only the most apt." 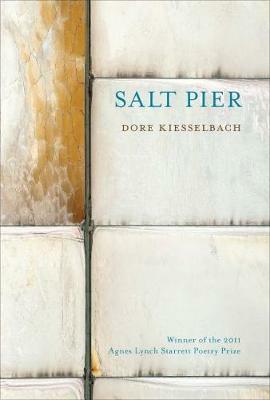 "If 'Salt Pier' is, in part, a study of the irredeemable, it is also an acknowledgement of the earthly redemptions almost slipping out of reach. That touch is possible is the affirmation--a tenderness too resilient to recant." "Dore Kiesselbach's poems reveal the particularity and/or strangeness of the commonplace--but many good poems do that. What strikes me about his, though, are the ways that visual imagery, diction, and cadence are modulated to fit his subjects. Thus in 'Rake' the inanimate object speaks (as in an Anglo-Saxon kenning) to describe the way it touches 'death / that life may be revealed / in green stupidity . . . fluent / as underwater hair.' In 'Hickey, ' a diver swimming among stingrays asks, 'How long does it take us / in water sunlight permeates / to forget needing ever to be told? '; the unusual diction suggests both the speaker's suspension in water as well as his apprehension of joy. The reader may hear faint echoes of Hopkins or the early Dylan Thomas, but the language is Kiesselbach's own." "As the diver beholds 'a moon dissolved in salt, ' so we behold the world transformed in these elegant, rigorous, unsparing poems by Dore Kiesselbach. With the problem-solving logic of syntax, a turkey falls dead from a tree, the duelist's bullet turns a pocket watch to shrapnel, a stepfather works his world of harm. Morally acute and musically distillate, this is a book to celebrate." "I have followed, with pleasure, Dore Kiesselbach's sinuous poems for several years. Some of them remind me of pythons wrapped around a tree limb above a riverbank. Those make me nervous. Others remind me of a favorite shirt, a shirt one will never relinquish, never. His poems, each one a tiny defibrillator, are a wonder." "[F]ascinating....Kiesselbach is...capable of bringing dark comedy into his investigations of the everyday....His knowingly clich d treatment of otherwise neglected subjects, on the other hand, reinforces suspicions about the effect of presentation and the importance of engaging critically with the familiar."